This skit was written directly from: Matthew 1:18-25, 2:13-15 & Luke 2:1-7. 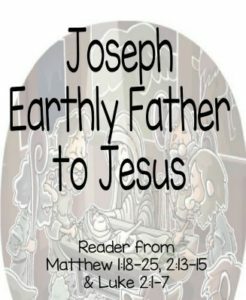 It would be a helpful teaching idea for Father’s Day and helpful activity to supplement our printable Father’s of the Bible booklets. Narrator: Now the birth of Jesus Christ was as follows: when His mother Mary had been betrothed to Joseph, before they came together she was found to be with child by the Holy Spirit. And Joseph her husband, being a righteous man and not wanting to disgrace her, planned to send her away secretly. But when he had considered this, behold, an angel of the Lord appeared to him in a dream. Angel: Joseph, son of David, do not be afraid to take Mary as your wife; for the Child who has been conceived in her is of the Holy Spirit. She will bear a Son; and you shall call His name Jesus, for He will save His people from their sins. Narrator: Now all this took place to fulfill what was spoken by the Lord through the prophet. Narrator: And Joseph awoke from his sleep and did as the angel of the Lord commanded him, and took Mary as his wife, and he called His name Jesus. Angel: (to Joseph) Get up! Take the Child and His mother and flee to Egypt, and remain there until I tell you; for Herod is going to search for the Child to destroy Him. Don’t miss our full Sunday School lessons for Father’s Day and our Father’s Day coloring pages.